Guaranted Lowest Telagawaja River Rafting. 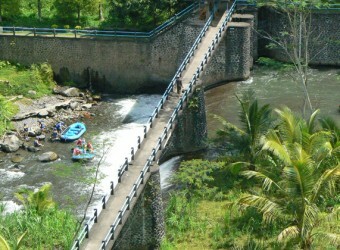 Bali Activity Telaga Waja River Rafting at a very affordable price! Only with US $34 you can join an exhilarating and exciting whitewater rafting about 12 km long on Telaga Waja River. The adventure includes return air-conditioned hotel transfers, shower room, changing room facilities, international insurance coverage up to US $50,000 etc. ※This insurance does not cover child (Age 9～11). Please use it by the responsibility of the customer. This special price is applicable with Darna transport car charter service (car charter fee is not include tour fee) . ※Please book with over 2 persons. ・After check in, change clothes and guide introduction. ・Change clothes, keep the goods and the car will take it to finish point. ・Keep your valuables in safety bag and the car will take it to finish point. ・Wear safety equipment life jacket, helmet and oar. （About 5 minutes after start）Meet drop and get down the boat for a moment, descent the steps then get on the boat again. （About 1 hour after start）Take a break at the bank of the river where the rafters can enjoy spectacular waterfall scenery. ※Bali International Rafting, Telaga Waja Adventures and Bali Rafting take a break at the same place. （About 1 hour 40 minutes after start）　Down 4m drop point! ・Give life jacket, helmet, oar and safety bag to the rafting company. ・Go up the steps to the restaurant. Take towel, goods etc. ・Outdoor shower room & changing room facilities. * Please contact us for pick-up service to other areas. * For booking more than 4 people. Can I bring camera or video? Yes、safety bag is available and the guide will keep it, but the insurance cannot cover damage or loss to your belongings. Can I take picture while doing the activity? Yes. You can take pictures while taking a break and the photographer follows the adventure, taking pictures during the adventure (price Rp.35,000). Can people of all ages join this activity? White water rafting adventure is suitable for people between the ages of 9 and 65. Free Pick up Service ： Nusa Dua, Tanjung Benoa, Jimbaran, Kuta, Legian, Seminyak, Kerobokan, Sanur and Ubud Area. Please contact us for pick-up service to other areas. My first rafting experience. It was very fun and I thought I was lucky I could join this activity! Rafting took almost 2 hours, fall into the waterfall, enjoyed the beauty of the valley, performance by instructor, etc. It was full of fun. This rafting package also includes lunch buffet. It was a perfect rafting experience. Complete Activity Package! This is full volume activity package which include cycling, ATV, Open wargen and horse ride!